My One Monthly Goal for February was to do the embroidery for a new tea cozy for my dad, who brews a pot of tea every morning. 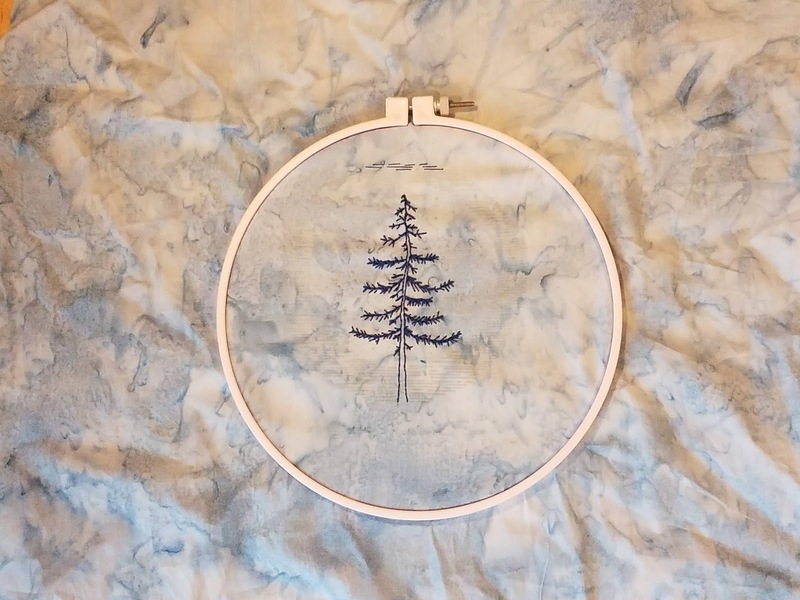 I chose a really lovely embroidery pattern by Cozy Blue Handmade that I thought he would like. Since I want the design on both sides of the tea cozy, I needed to stitch the design twice. I'm pleased to say I got them both done! I actually spent the first two weeks of February with my dad, so he's seen the pattern and approves. Just so you have proof that I really did stitch it twice, here they are side-by-side. Many of these are among my favorites. The only one I had not seen before is Charade. Linking up with Patty of Elm Street Quilts. It's my very first Island Batik Ambassador challenge!! 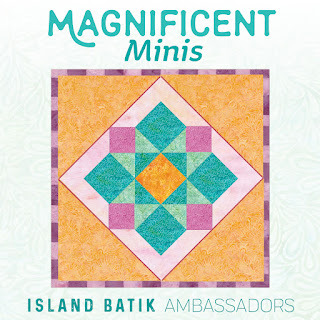 February's theme is Magnificent Minis. The only requirement is a maximum size of 24" x 24". 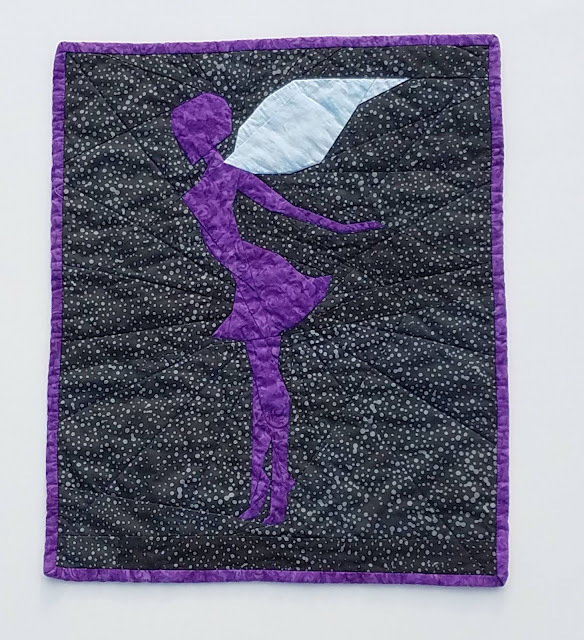 I chose a fairy block designed by Juliet of The Tartan Kiwi. The date on my download is December 30, 2015 so I've had the pattern for a while. 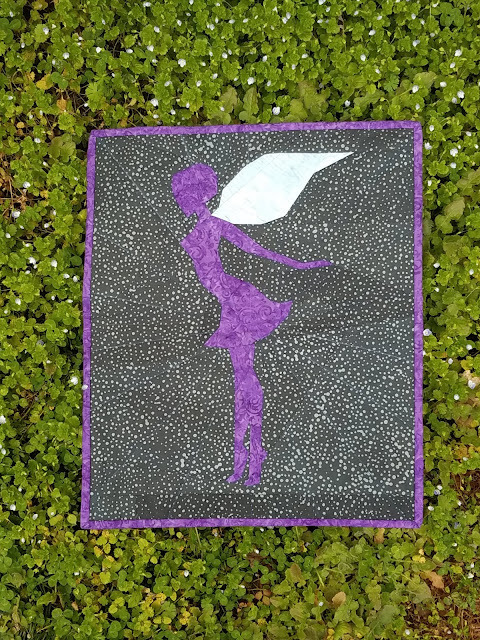 I am so happy to now have a completed fairy mini quilt! 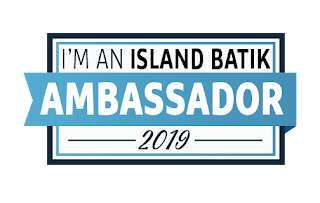 The fabrics were provided to me by Island Batik. Hobbs and Aurifil also provided materials that I used in this project. 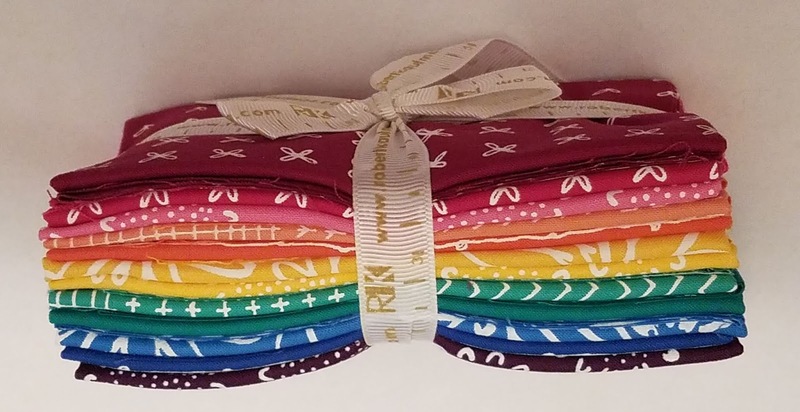 The original pattern is a 12" block. I enlarged it to be a 15" block and I'm glad I did--even enlarged, some of the pieces are pretty small. 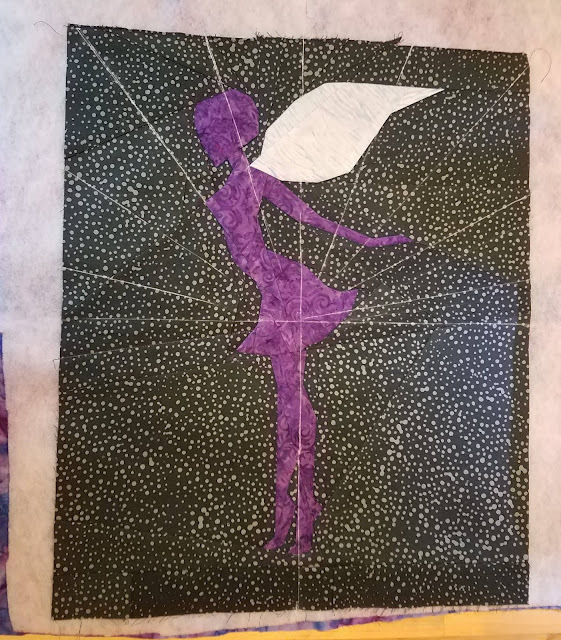 I still don't love paper piecing when I'm doing it but I sure do love the results when I get an image it would be impossible to piece traditionally. The fairy's feet were really close to the bottom and I wanted a little more space between the feet and the binding, so I added a strip at the bottom. Then, to make a clear rectangle, I trimmed a bit off the sides. The final mini measures 13 1/2" wide and 16" tall. I don't see the pattern for sale any more but here is the original post with Juliet's fairy. I used only three fabrics in this mini. The background is a blender from the basics collection called Bubbles in grey. I imagine that the "bubbles" are stars and the fairy is flying around on a star-lit night, which is why I chose to name this quilt Night Fairy. The fairy is also a blender, Dandelion in jelly. 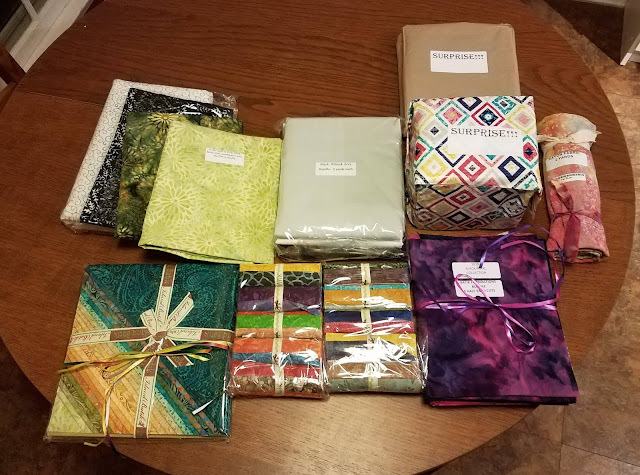 The wing fabric is from one of the strips in my stash builder roll. 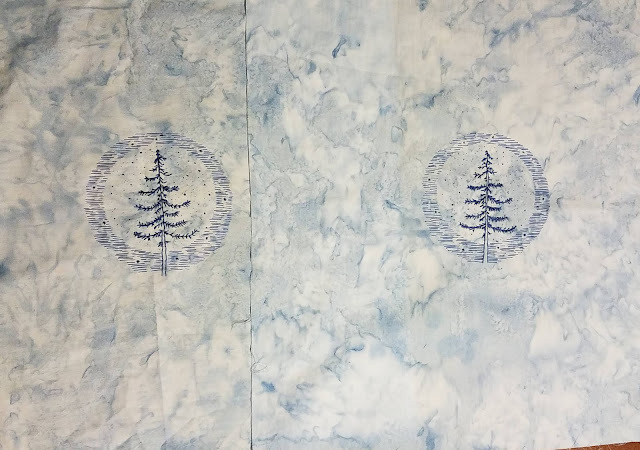 I wanted the wings to look like light and this blue-and-white batik really captures the look I was hoping for. I know it looks like it doesn't blend, but given that you can't see the part I unraveled, it does! For the quilting, I used Auriful 50 weight thread color 2783, medium delft blue. I used Hobbs Thermore batting which is nice and thin, perfect for a mini that will hang on the wall. 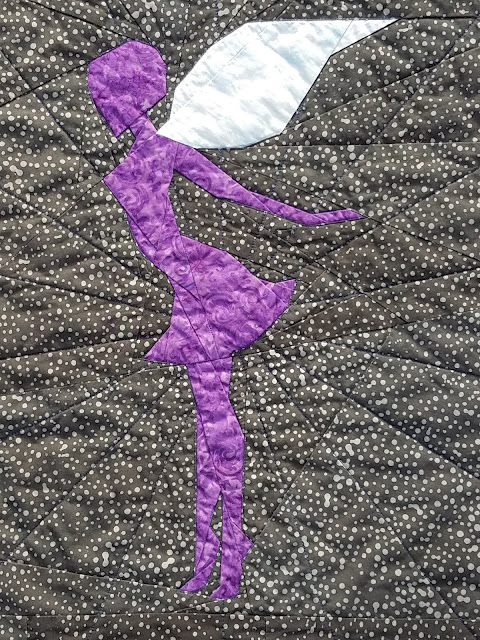 The first quilting I did was to outline the fairy herself. I shortened my stitch length for this part for more precision in the outline. 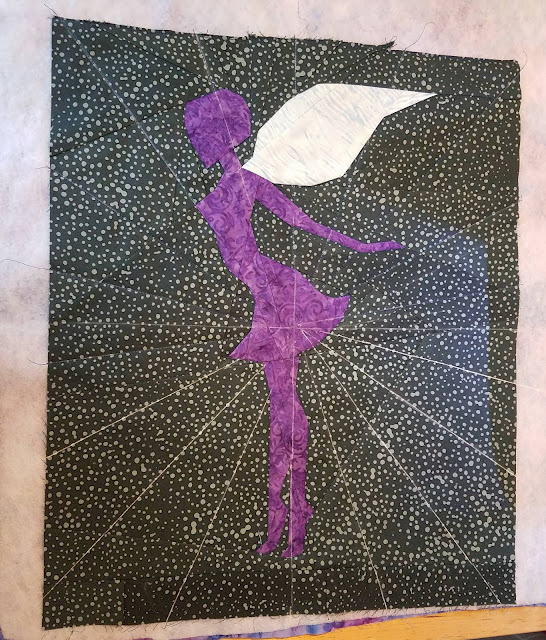 Then, I envisioned straight lines radiating out from the fairy. I thought about how to do this for a while. Ultimately, I decided that a Dresden Plate wedge would give me the look I wanted. I found this article that explained the angels for the Dresden Plate and used one of the printable templates linked in the article. I chose the 18 degree Dresden. My first step was to mark the vertical and horizontal axes at the halfway point. 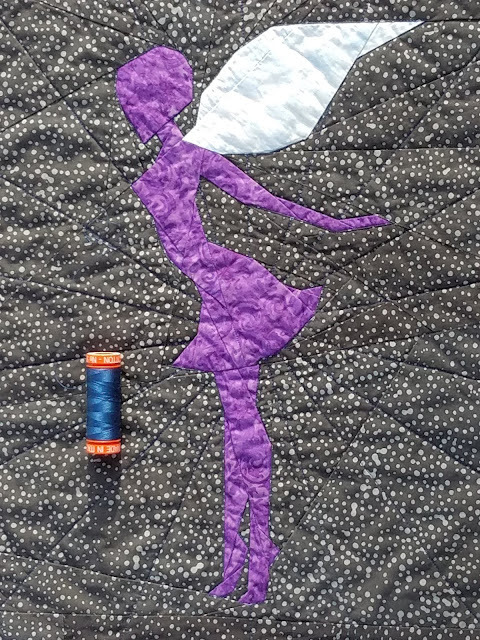 I wanted the quilting to radiate out from the fairy so I didn't stitch any lines through any part of the fairy's body, including the wings. Once I had the center point established, I filled in the top half of lines using my template. I marked my lines with a Clover chaco liner. 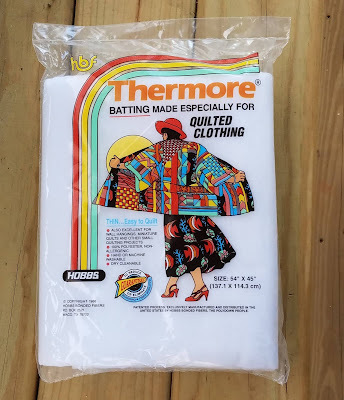 I know a lot of quilters like a hera marker for lines but I suspect those people are actually magicians. My indentations are never visible and that method just does not work for me, so I use visible lines that are easily erasable. The white chaco liner works great on dark backgrounds. I find that most of the chalk disappears when stitched over. 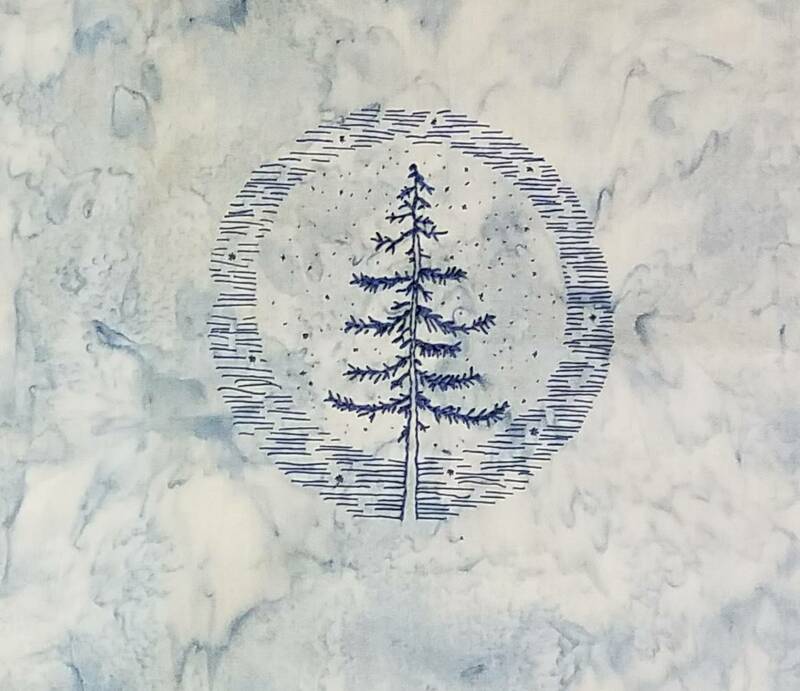 It can also fade when touched too much, which is why I only marked the top half to start. Once I stitched those lines, I marked the bottom half. You can kinda see the radiating lines in this picture. 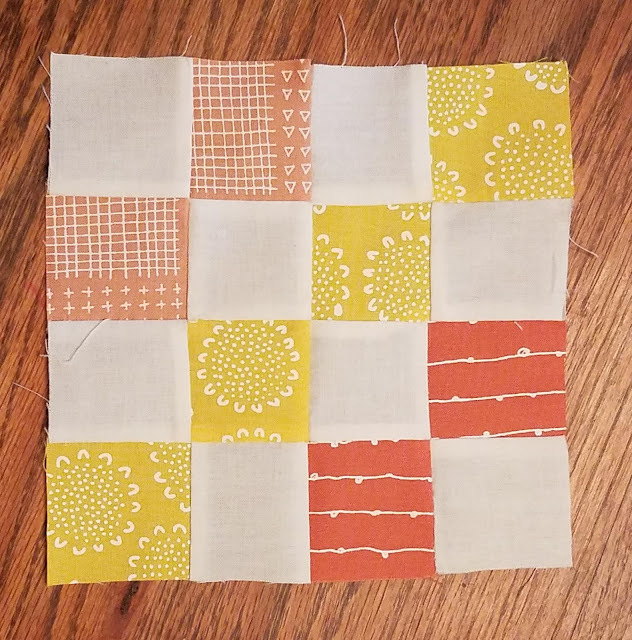 I'm happy with how the quilting turned out. 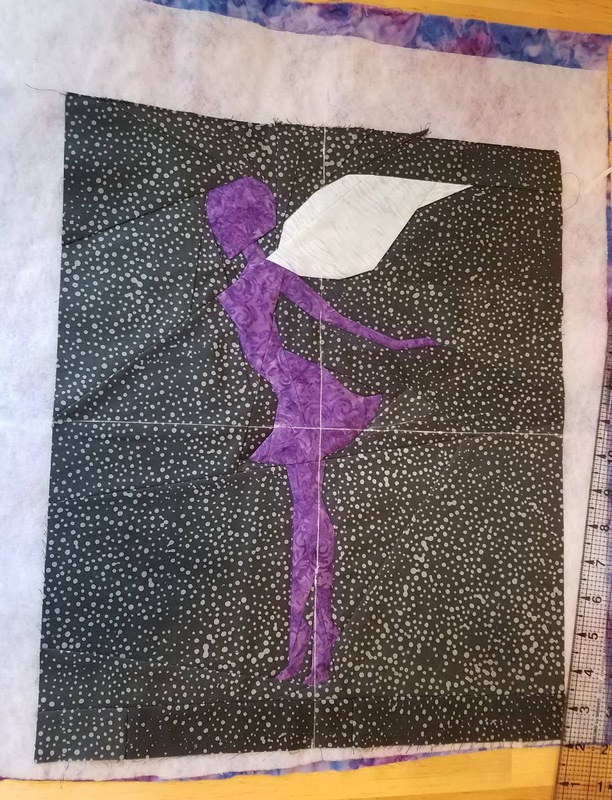 I am so happy with this fairy! I love her bright purple color and background of stars. 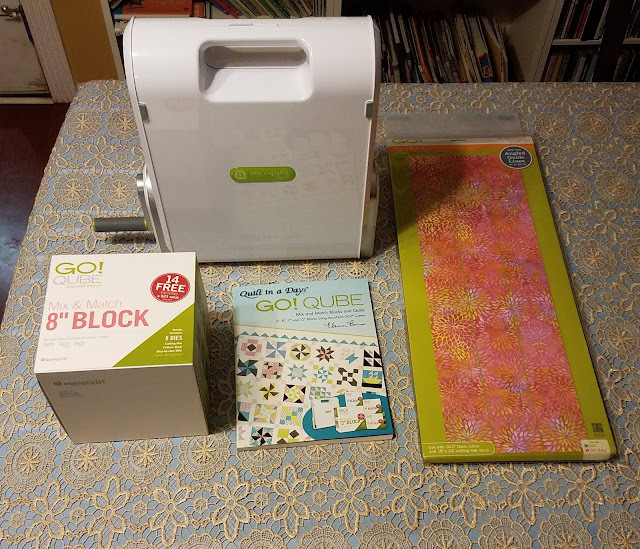 I plan to add her to my recently relocated wall of mini quilts in my office. I've got a spot picked out for her by the window so she can easily fly out and have adventures. 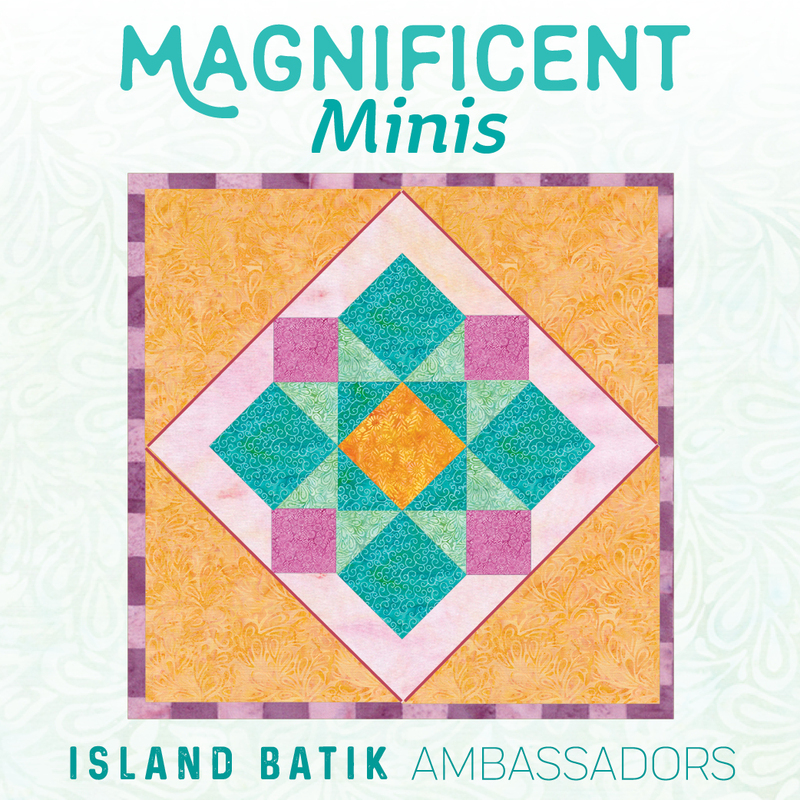 Thanks, Island Batik, for giving me the opportunity to create this Magnificent Mini! I spent the first two weeks of February in Portland, Oregon. I was there mostly to see family and be in a caretaker role, but I did have a few chances to get out and about. On my first outing, I had walked downtown from my dad's apartment. When texting me directions on how to walk back, my brother gave me an address I would pass on my walk home and said "it's like a thrift craft store." Obviously, I was going to check that out. Oh. My. Gosh. 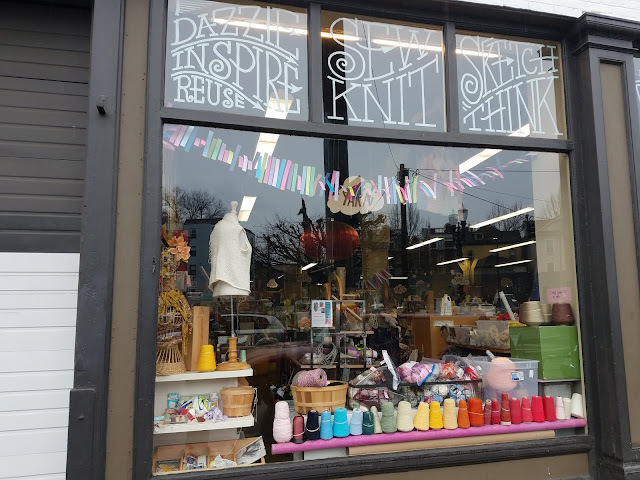 You guys, this place was like thrifty craft nerd heaven. It's a nonprofit started by a teacher as a way to share supplies and keep stuff out of landfills. It's donation based, so it is a thrift store in that way. 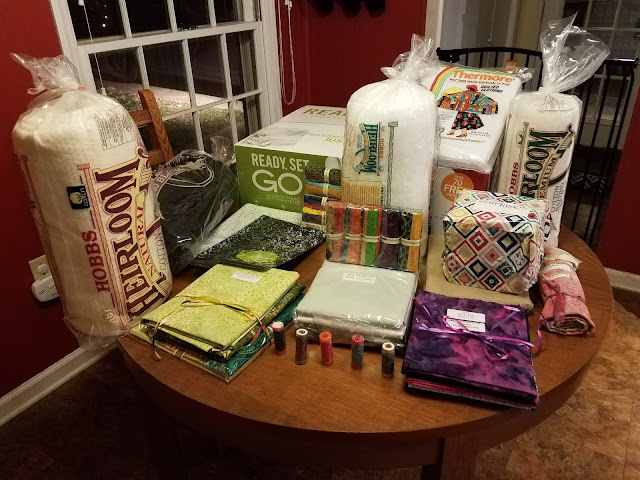 Things are loosely organized by craft type (collage, paint, yarn, fabric, etc) and there is a lot of random stuff that could easily be used creatively. Prices are really low. They also do kids camps and various maker events for adults. 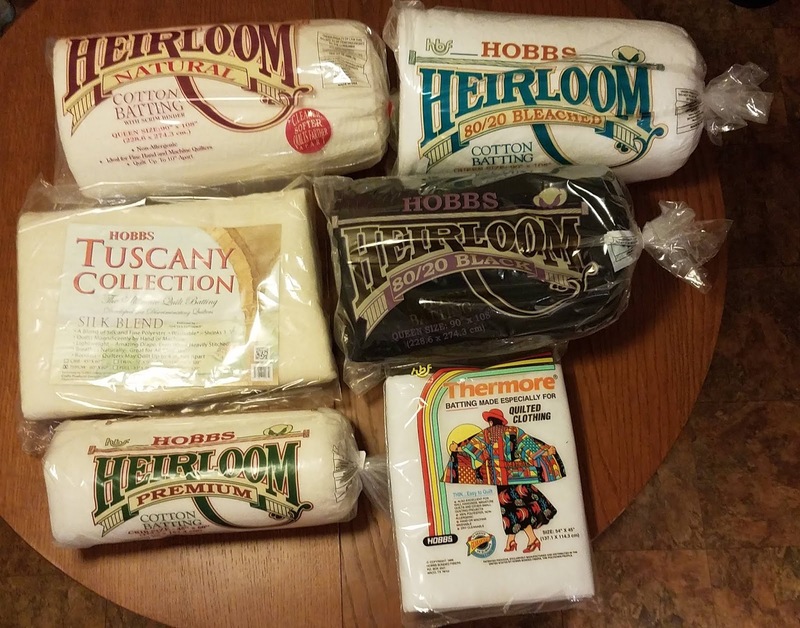 I spent $6.30 and this was my haul. 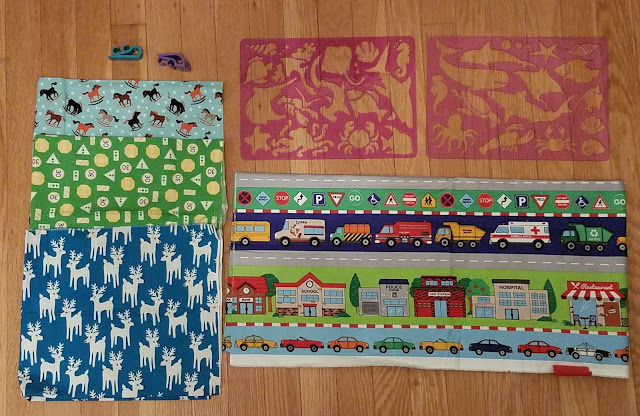 The three fabrics on the left are fat quarters ($1 each) and the town/truck fabric is a full yard ($3). 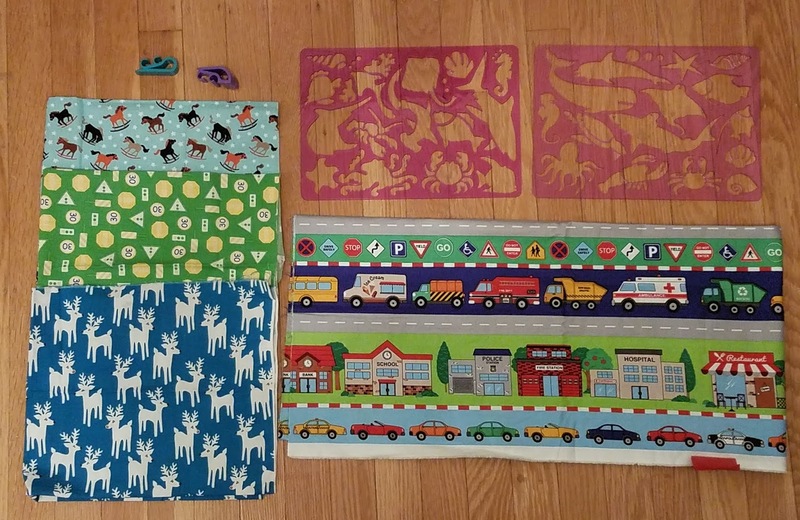 That town fabric was a real find for me because it features some of my son's favorites: a fire station and a fire truck. There is also a police car, an ambulance, a police station, and an ice cream truck, all notable on their own. I'm working on an idea for an ocean quilt so the two sea life stencils (ten cents each) were both inspirational and timely, and the two plastic things in the upper left are pencil grips (5 cents each) that I'm hoping I can attach to the pegboard in my sewing room so my pencil is easier to find. I first visited on a Thursday. The following Tuesday was my last full day in Oregon and I walked downtown to have lunch with my sister-in-law. On the way home, I stopped at Scrap again, because why not? They had clearly gotten some new fabric processed because it is unlikely I would have missed the fat quarters of novelty fabric. 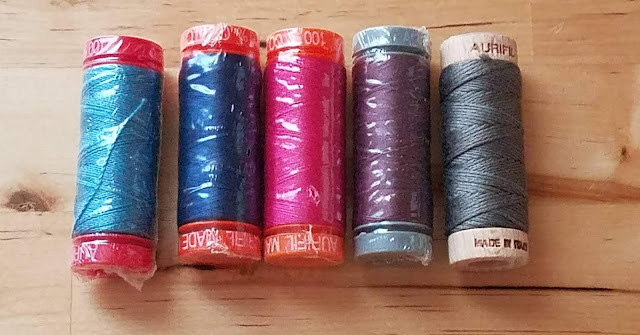 My second haul was $8.75. 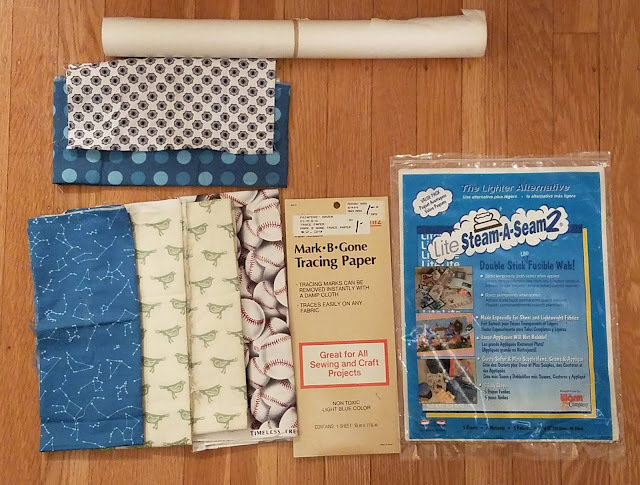 There are five more fat quarters, a fat eighth (50 cents), a tracing paper that I'm planning to try in an upcoming project ($1), a package of lite steam-a-seam-2 pages that look to be in great condition (25 cents) and a substantial roll of heat-n-bond lite ($2). I'm hoping that I can trim the steam-a-seam slightly and use it in the printer, but even if that doesn't work I am set on fusible web for a while to come. I've already used some of the heat-n-bond for this month's Stash Bee blocks. 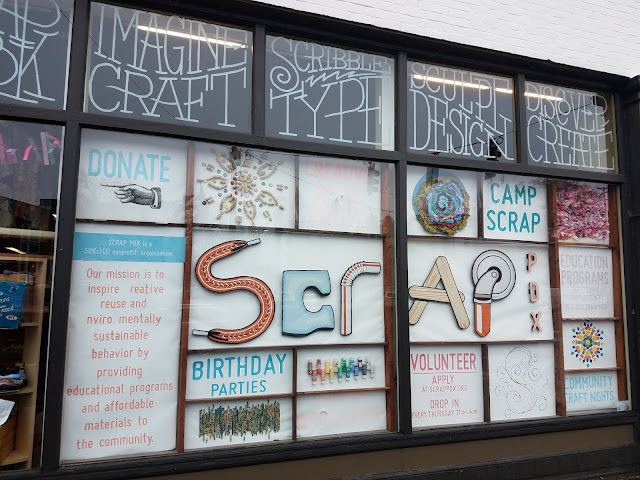 The store is called Scrap and you can see more about it here, and there are now a few other locations in the US. I had a great time looking at everything and would have loved to take my son to see what crazy stuff he would like to make from other people's craft leftovers. It's such a great concept; I wish there was one in my area!